Please submit your photos to be included! 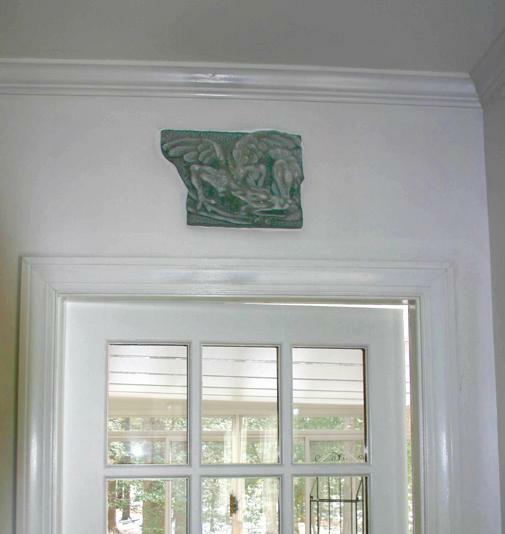 New client Dave Emery shows us how he and his wife have mounted and displayed the #537 winged griffin fragment over an interior door. Dave's wife did a little dry brushing of the highlights with white paint to accent the detail further. Nice job folks! 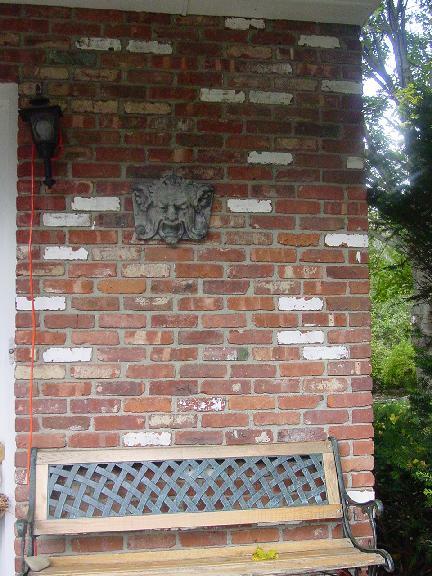 Here's the #285 grotesque in Old Limestone Grey in a weather protected setting, he looks very natural on the brick wall above the little bench. Photo from Doreen in New York. 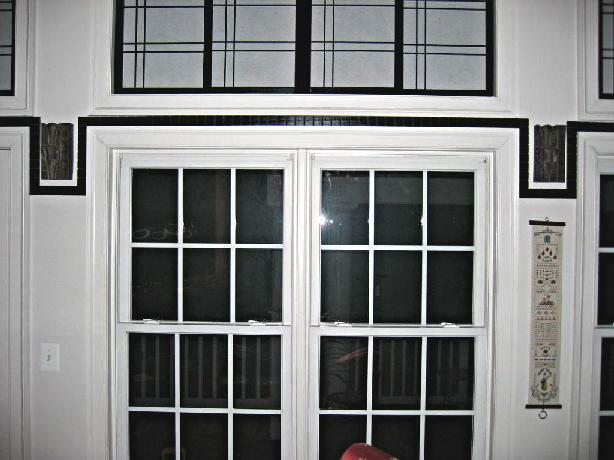 Rick in Virginia displays what he designed in his Art Deco themed home, he used three of my 8A Art Deco panels in an attractive design on the wall between his windows. 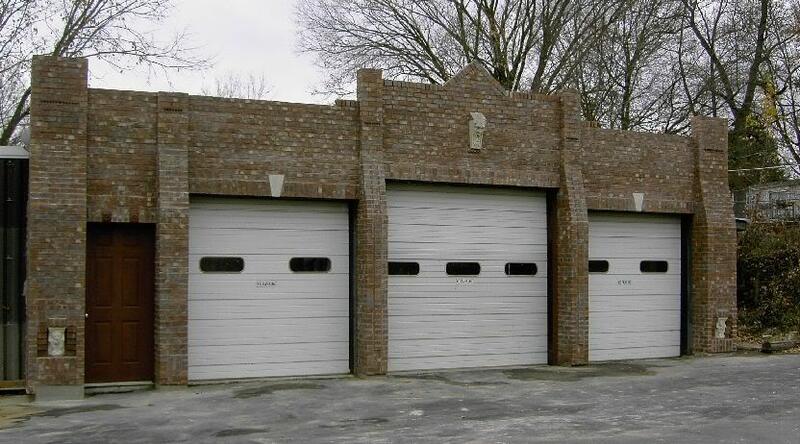 They look custom made for the space, great job Rick! New client Katey in Alabama shows off her bathroom decorating skills with my #100 corbel which splendidly complements her pretty framed prints of flowers and flower vase! 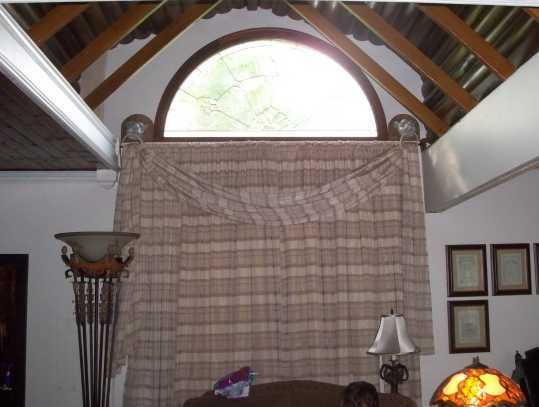 Now this is an inviting room. Thanks so much Katey, been a pleasure assisting your decorating! 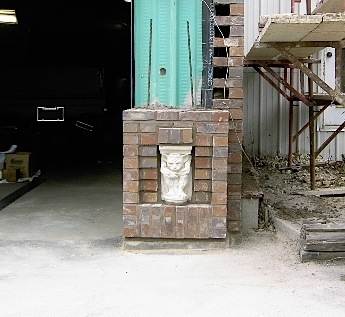 Another Dave is building a new shop for himself and purchased several pieces in concrete to be incorporated into his new brick facade, here is the start of Dave's project- it hints at Art Deco a little to me, and the brick design around my Nr. 81 Gremlin sculpture is stunning! This forms the base of a support column. Larry, yet another client! 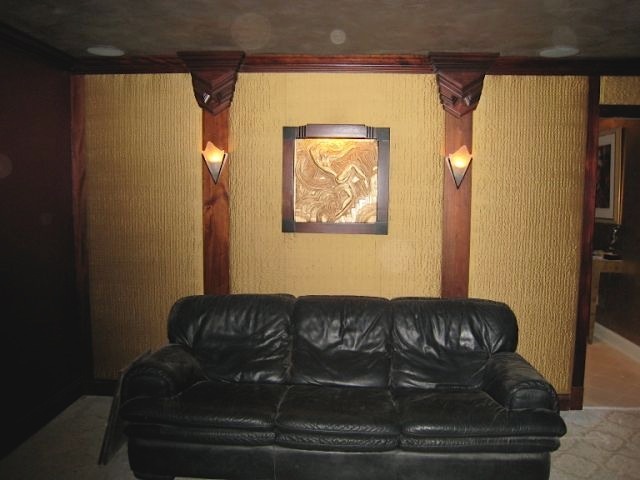 built himself a really unique Art Deco themed home theater room around my Folies Bergere Art Deco panel Nr D4-R. Larry framed the panel in wood and then constructed a very classy wood lamp shade that perfectly complements the installation. 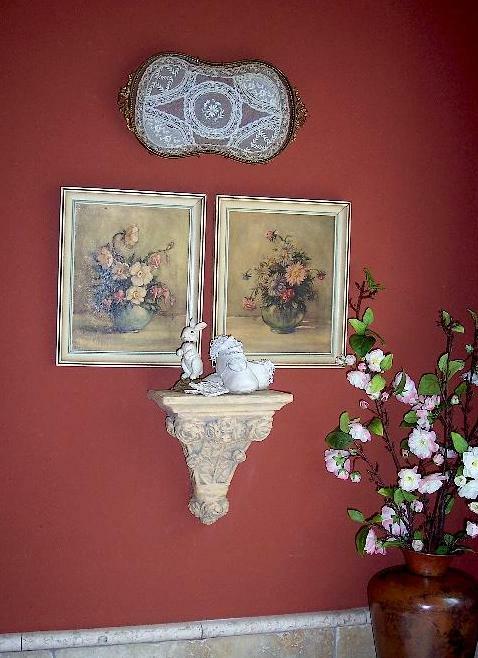 Janet sends along two photos showing how she used a pair of my Nr 168 gargoyle heads which she mounted on wood plaques, and then mounted these above the window to be used as curtain holders, way to go Janet! Cynthia's new Art Deco theme in-ground pool in Florida sports four of my Nr. 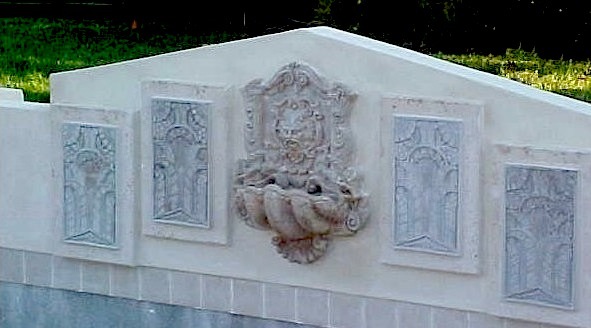 98-R panels cast in exterior concrete, in the header wall with a commercially available fountain in the center. 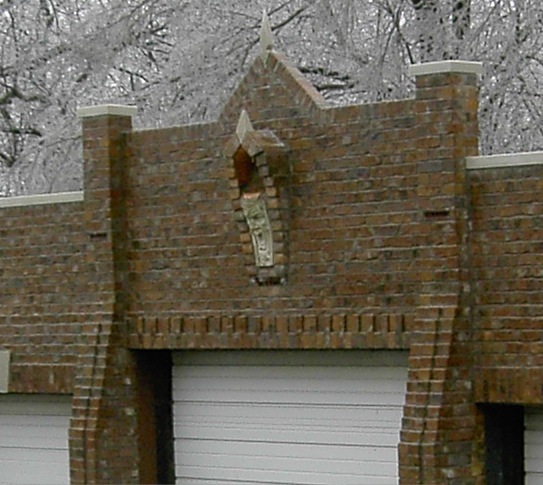 See what you think of it so far....neighbors are wild about the deco panels! Absolutely love them! Ben, a Birmingham MD and repeat client purchased my Nr. 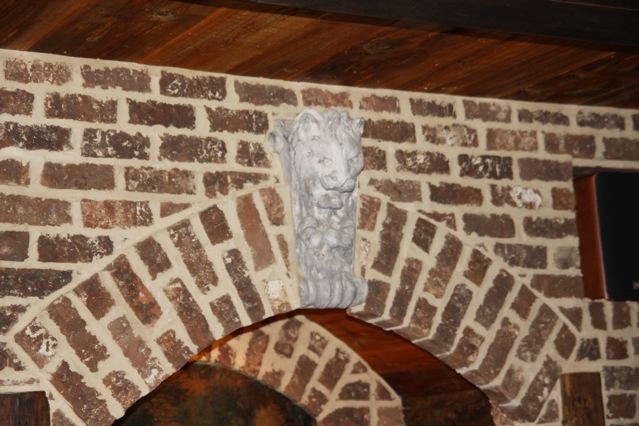 3886 lion keystone in concrete to embed into his new brick arch in the wall, awesome room and the keystone sculpture adds visual interest to what may otherwise be bland and plain arch. 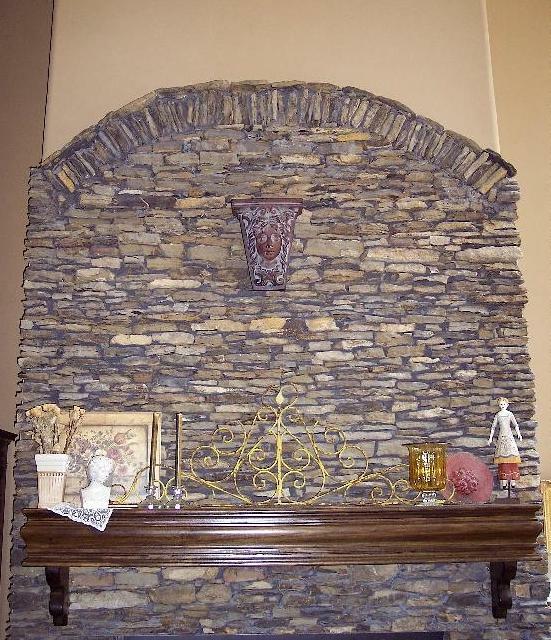 Great thing here is the keystone was used just like they were over a window. 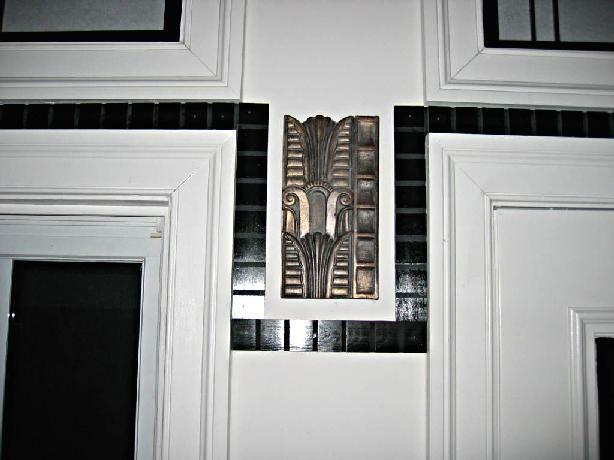 Veronique in London sent along this photo of her new Art Deco D4 panel, as can be seen she adores Art Deco and her room reflects this. 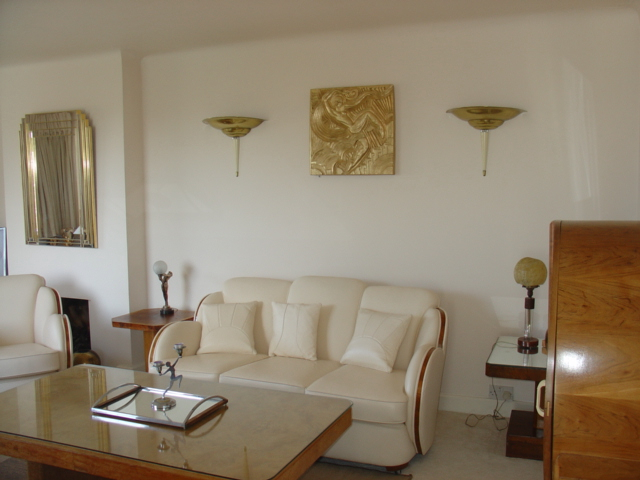 The bright gold finish on the panel complements the two Art Deco uplights on either side of it over the sofa. So far Veronique is the only one in the UK who has this panel, so her room will be unique for many years. I'll let her comments below speak for themselves verbatim. While I have in the past shipped small items overseas on occasion, the shipping costs were horrendous and there is a much greater risk of damage due to the stop at customs and possibly unpacking the shipment for inspection. I made an exception in Veronique's case because she did the leg-work at her end to find a UK carrier who would pick up the crate here in the USA and bill her credit card directly for the transportation, insurance, customs fees, and duty if any. My canvassing USA carriers resulted in an over $600 quote from UPS for this shipment, Verinique got a quote for approximately $300 USD. The Picaud arrived on Friday at 3pm (UK time), which was unbelievably quick. The crate was very well made and the Picaud panel arrived unscathed. 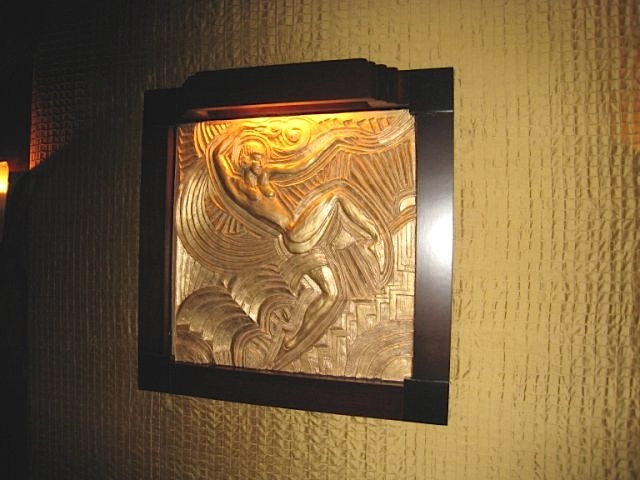 The panel is absolutely beautiful and I am really thrilled to have it in the living room.I enclose a photo of our art deco living room with your panel in place. It was a little dark today so you may have to adjust your screen light view. I am happy for you to use it for your website. If you need a lighter photo, let me know. Many thanks again for such a great service (quality of the panel,the promptness of your responses to my emails and the solidity of the packaging). I am very happy. If you have customers in the UK, I would recommend Fast Lane shipping. They were good, quick and a lot less expensive than other couriers at �150. 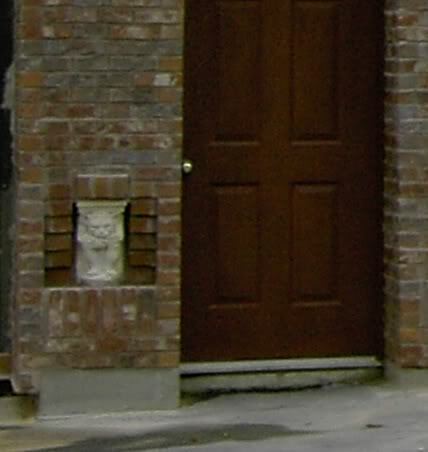 Originally Melissa wanted 2 to install as keystones on her house, but circumstances changed for her before they could ship. 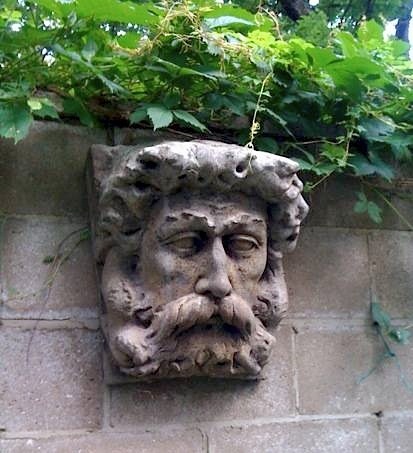 3 years and a move to a new house later she decided to have one on her garden wall. 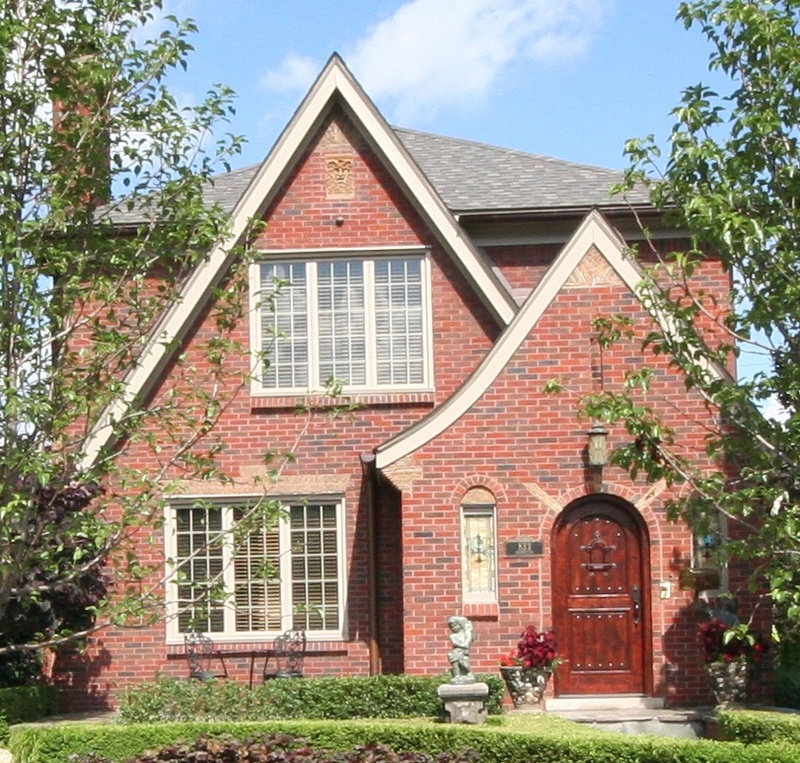 Jim's previous house in Birmingham Michigan sports several of my sculptures. 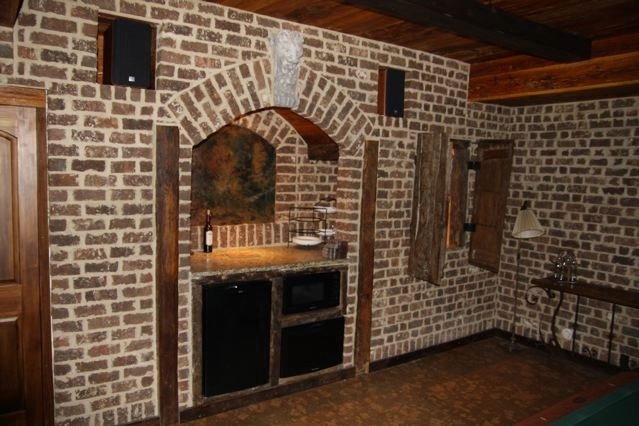 They were stained by Jim and so nicely match the existing accents they could be mistaken for having always been there! This house is just as cute as can be, and interestingly enough a nearby town has a house this reminds me of with that small sloping roof over the entry the same way! Having ordered several more sculptures now, we'll see what Jim comes up for his new location, going by these two photos I'm sure it will be spectacular! The first photo shows the 649 Pan grotesque panel up under the apex of the gable, where it fills the space left by the removal of an ugly atic vent louver. 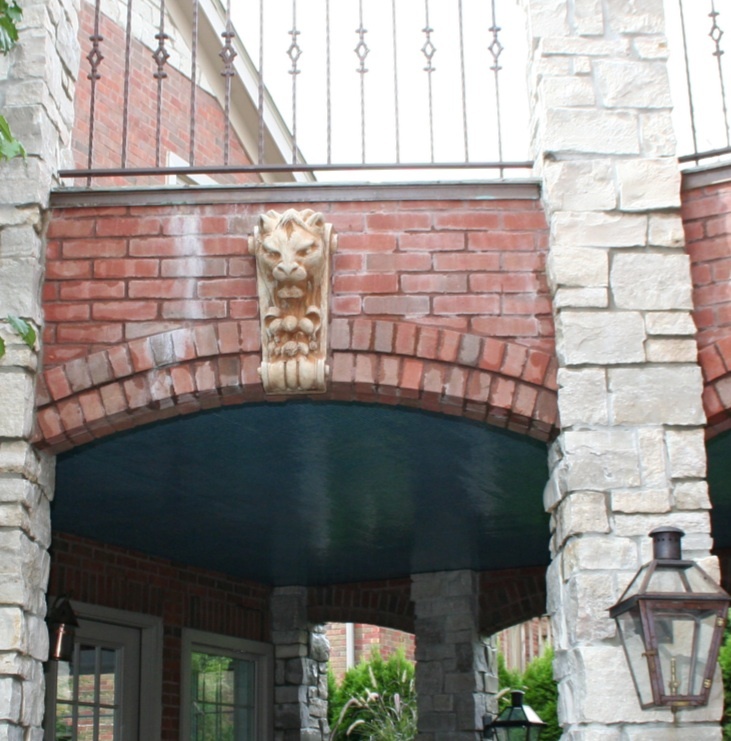 The second photo shows the 3886 lion installed in an arch as the keystone it was designed to function as.